The HARTING Technology Group will once again present a wide range of new products and smart solutions (Hall 11 / Stand C13) at this year’s HANNOVER MESSE (1 April to 5 April 2019). HARTING will be emphasising this year’s motto for the HANNOVER MESSE: “Integrated Industry – Industrial Intelligence”. This means combining human and artificial intelligence to create industrial intelligence that adds value for customers. The HARTING products are smart, clever and easy to handle. “microSNAP”: together with Kuka, HARTING will be presenting a corresponding robot-operated charging station for quickly recharging batteries separately. HARTING is driving development forward in Ethernet connectivity for the networks of the future. 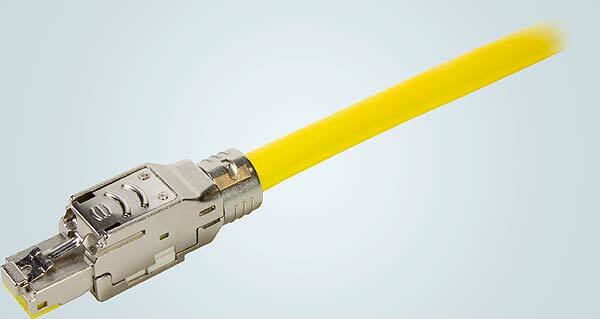 Single Pair Ethernet (SPE) is a hot topic in the market for industrial cabling. HARTING provides the right standardised interfaces for this and will be showcasing the first serial products at HANNOVER MESSE 2019, making the leap as a pioneer of Industrie 4.0 from a technology trend to real-life application and a customer-specific solution. “We are following our own consistent path with an IEC standardised interface: recognising trends, defining standards and delivering reliable products,” says Frank Welzel, Director of Product Management, HARTING Electronics. The HARTING stand will include the first IP20 interface consisting of a connector and a PCB socket. With RJ Industrial® in the new MultiFeature series, HARTING has been able to fulfil its customers’ wishes and requirements for even easier operation and assembly in the field. Further development of the successful RJ Industrial® standards has resulted in tool-free assembly, simple operation and a robust metal housing. The ability to use these for AWG 26 to 22 wire strands and their robust cable attachment are properties that make installation easier and quicker for the installer. While the classic RJ45 was a telecommunications development that was not enough for every industrial demand, the HARTING RJ Industrial® MultiFeature series can cope with all the requirements and challenges of a hard operating environment. Safe Cat. 6A performance, IP20 and IP65/67 housing combined with PoE power supplies IEEE802.3af (PoE 15.4W) / IEEE802.3at (PoE 25.5W) / IEEE802.3bt (PoE 100W) supply data and power for any device. Dr. Metrix is the new face of time-saving PushPull interlock mechanisms. 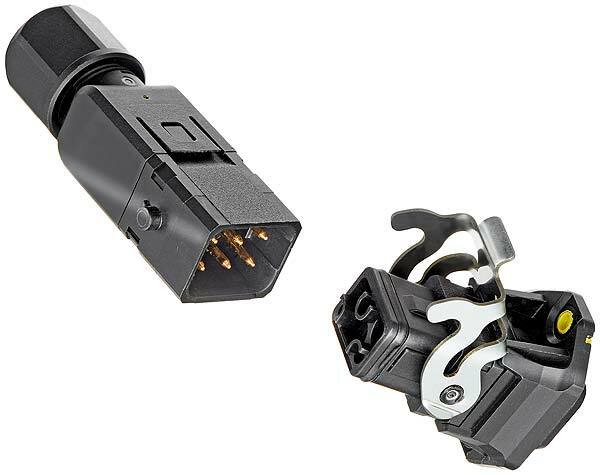 HARTING’s new heroine represents clever PushPull technology on metric circular connectors and connection in seconds. Dr. Metrix first provided a comprehensive M12 PushPull solution for factory automation on SPS IPC drives. It will continue its mission at HANNOVER MESSE 2019, jetting into the future with one click. [l.] M12 PushPull for factory automation, [r.] Dr. Metrix, HARTING’s new heroine for metric circular connectors with PushPull interlock mechanism. Standard is the main keyword for all the highlights at Hannover Messe. Although proprietary solutions can be just as good, they usually remain an isolated solution in the long term. Investment security, a recognised form factor for the device and familiar operation are positives for everyone along the value chain. Standardised mating faces, easy assembly and simple operation in the field benefit everybody. “Standardisation helps the CEO of a company, the constructor and, not least, the user. Everyone feels like their plans are more secure,” says Frank Welzel. In machinery, Han® 1A facilitates the efficient combination of tools and modules such as heating or cooling units, fans, control terminals, lighting systems, drives, vibration conveyors and similar equipment. In traffic technology, you can use Han® 1A to connect door drives and access systems, as well as lighting, headlights, loudspeakers, screens, display panels, warning and alarm lights, push buttons, acoustic signals and windscreen wipers. HARTING now offers the metal housing for the Han® B, EMC and M series in versions that allow the rear assembly of contact inserts. The new option makes it easier to assemble interfaces for control cabinets, aimed particularly at applications in machinery and automation, robotics and traffic and energy technology. Han® connectors with metal housing are the ideal match for environments with high requirements in terms of component robustness and the simplest possible installation. Until now, the assembly of Han® metal housings required the cable to first be fed through an opening in the control cabinet so that the inserts could be assembled outside the cabinet and pulled back into the bulkhead housing. 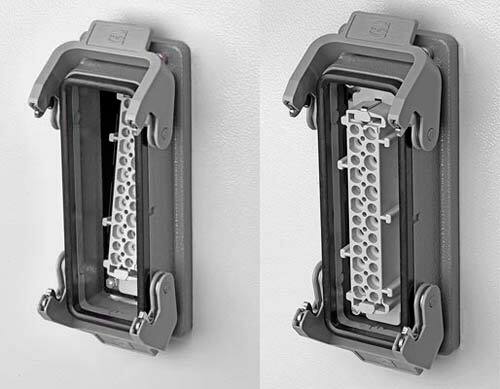 The new Han® solutions also allow for pre-fabricated inserts to be locked in place directly in the bulkhead housing – from the inside of the control cabinet. The HARTING stand in Hanover will be also be presenting the “microSNAP”, the latest vehicle concept from Swiss automotive visionary Frank M. Rinderknecht. The bold idea behind “microSNAP”: the quick removal and replacement of the chassis, drive (“Skateboard”) and bodies (“Pods”). Together with Kuka, HARTING will be presenting a corresponding robot-operated charging station for quickly recharging batteries. A Kuka robot connects the HARTING charging plug and ends the charging process when the drive battery has reached the required charge level. This means that the vehicle is ready to use again in a very short space of time. A solution with plenty of areas of application.